We all see the ads touting "one of one" cars, usually accompanied by multiple exclamation marks and unrealistic asking prices, as if that's somehow a gauge of a car's value. Arguably it might be more impressive to find two identical Mopars these days. Rare cars are rare for a reason. You can quote me on that. A car like a '71 Hemi 'Cuda convertible is unquestionably rare. There were something like 14 produced and every one of them is different in one way or another. "One of one" is completely meaningless in that context. If two of them were identical, do you think they'd be relegated to the bargain basement at a high-profile venue? Would the owners be embarrassed to be seen at the same show together? Of course all the '71 Hemi 'Cuda convertibles are "one of one", they pretty much have to be. What about cars with higher production numbers? Some cars are "one of one" because nobody in their right mind would have ordered one new. 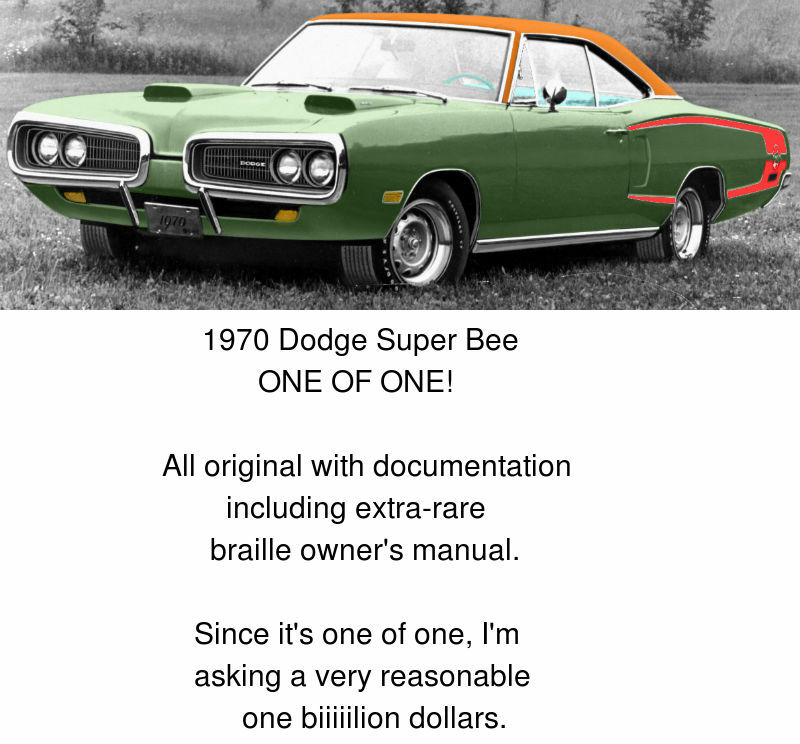 If I had a documented survivor '70 Super Bee for sale and from the factory the exterior was light green with an orange vinyl top, red stripes and a turquoise interior, would you buy it? Seriously, would you? It has to be "one of one" because it looks like a circus tent, but would you shell out cold hard cash for it? Would you actually drive it? More important, would you pay a premium because it's "one of one"? Likely I'd have to sell it at a deep discount to keep my neighbors from complaining. Or haul it to the paint booth in the dead of night. "One of one" is meaningless in this context. Lately there have been a number of relatively common models being described as "one of one", sometimes with the useless term "known to exist" attached. If it's the only one of its species, ask the seller how he determined that, then ask him how he determined the asking price with no access to comparable sales. After all, it is the only one in existence, right? computer to speed car delivery to their customers. 6.3 million far exceeds Chrysler's automobile production in 1966, let alone the production total of 1966 Dodge Coronets. Theoretically, every single 1966 Coronet ever produced could be a "one of one". In reality, a significant percentage of them are exactly that, as are other models. Unless the car happens to have every option exactly the way you would have ordered it new, ask yourself why it matters.